The Terrascience SA-102 Series Servo Accelerometers offer an unparalleled combination of high performance and excellent stability. 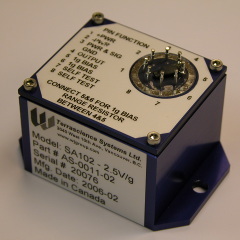 The compact accelerometer package allows the SA-102 uniaxial accelerometer to be installed with a footprint that is as small as, or smaller than, most uniaxial force balance accelerometers. Typical applications include seismic monitoring applications, vibration measurements, and tilt sensing in both indoor and outdoor environments. The corrosion resistant aluminum package is NEMA Type 4X waterproof rated and can be anodized or nickel plated. The SA-102 is used in the fuel control system in Lockheed Martin’s F-117 Stealth Fighter.